Daughters, as they continue packing their belongings to move to college. Sons, that they find patience and peace during the next few weeks of transition. They already miss their sisters. Kevin, that he finds work soon. My last A1c was 5.1!! That my friends, is the result of years of hard work, healthy eating and working out like a crazy woman. ugh. All creative cells have gone into hibernation until the weather cools off. Except for a few quirky ones that are working on a knitted pig. Yes, a pink, knitted piggy. It’s a test knit for a pattern designer. 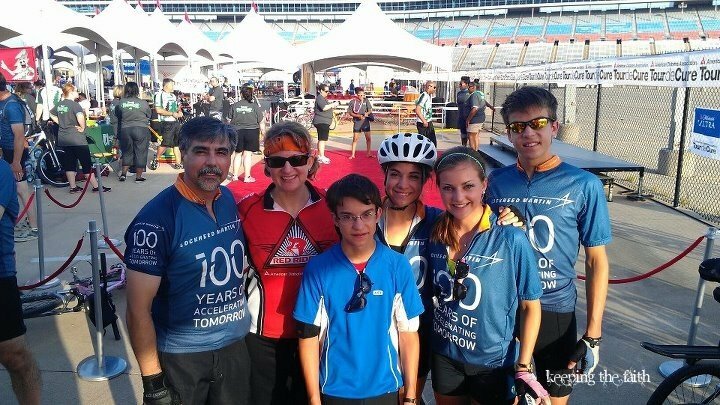 Our weekend ride at Tour de Cure was AMAZING! We ended up riding the 32 mile route, as the temperatures were creeping quickly into the triple digits. Oh Mercy. The back to school and off to college madness continues. DirtBike gets his braces on this morning. Princess Pea and Cherry Ames have started packing, so there are bins, boxes and piles lined up through the living room and dining room. We love breakfast for dinner! I don’t know what an “A1c” is or the number range, but I’m happy for you b/c you’re happy. I enjoyed the family picture/slide show. A1c is lab test that gives an indication of how well a diabetic person is keeping their blood sugar in control. 5.1 is well within the “normal” range for a non-diabetic person. It doesn’t mean that I no longer have the disease, though. It just means that I am able to keep it controlled – sort of like remission. You have the best menus…really…maybe you should plan a week ahead and we all can share LOL! Sweeet joob at that A1c. Mine’s 6%, so my doc took me off insulin. I am happy. Good for you on the A1c, Angela! Sometimes we think we are doing this for nothing, but THAT is proof. A house with no girls? BooHoo. Great pic with your family and all your official gear on for the Tour – great companionship shows. was thinking it would be nice to have a recipe section perhaps over at Suscipio? Your menu does sound yum! I am so glad your diabetes is being manageable!! It is tough to live with, my sister in law has diabetes.